Random House Publishing Group, 1975. Mass Market Paperback. Acceptable. Disclaimer:A readable copy. All pages are intact, and the cover is intact. Pages can include considerable notes-in pen or highlighter-but the notes cannot obscure the text. At ThriftBooks, our motto is: Read More, Spend Less.Dust jacket quality is not guaranteed. Random House Publishing Group, 1975. Mass Market Paperback. Acceptable. Disclaimer:A readable copy. All pages are intact, and the cover is intact. Pages can include considerable notes-in pen or highlighter-but the notes cannot obscure the text. An ex-library book and may have standard library stamps and/or stickers. At ThriftBooks, our motto is: Read More, Spend Less.Dust jacket quality is not guaranteed. Random House Publishing Group, 1975. Mass Market Paperback. Good. Disclaimer:A copy that has been read, but remains in clean condition. All pages are intact, and the cover is intact. The spine may show signs of wear. Pages can include limited notes and highlighting, and the copy can include previous owner inscriptions. At ThriftBooks, our motto is: Read More, Spend Less.Dust jacket quality is not guaranteed. Ballantine Books. Very Good. 1975. Soft cover. 0345243544 . Vintage paperback. Spine slightly rippled. Covers show some wear. Small water stain on first few pages of book; does not affect text. No owner's name inside book. (See photos. ); Book . Ballantine Del Rey. MASS MARKET PAPERBACK. 0345243544 Very Good Condition. Five star seller - Ships Quickly - Buy with confidence! . Very Good. Ballantine Del Rey. Used - Good. Ships from Reno, NV. Shows some signs of wear, and may have some markings on the inside. 100% Money Back Guarantee. Shipped to over one million happy customers. Your purchase benefits world literacy! NY: Ballantine, 1975. 1st printing, Feb. 1975. 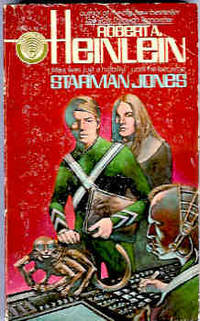 Cover art by Lee Rosenblatt. Tanning; a little bowed from poor stacking; minor creasing and scuffs to rear.. Mass Market Paperback. Very Good+. Ballantine Del Rey. MASS MARKET PAPERBACK. 0345243544 1976, 4th print. Ships next day. Book is in good shape, no scribbles, highlighting or underlining, has a little rubbing on the edges, has a little nick on the bottom of the spine, a little general wear, from a smoke-free environment. Items are typically shipped in a plastic bag, in a cardboard cradle, in a manila envelope. Most of my customers rave about my packaging. All US items are shipped with delivery confirmation, if you require this, please let me know. . Good. New York, NY: Ballantine Books. Good. 1976. 27th Edition; Fourth Printing. Mass Market Paperback. 0345243544 . Spine/covers a bit creased. Front cover scuffed. Some foxing. 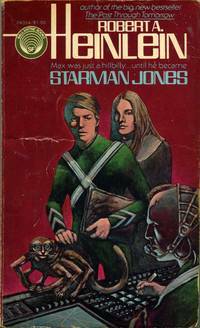 "It's easy to stow away on an intergalactic spaceship, if you're a smart lad like Max Jones. But it's quite another thing, when the spaceship touches down on an unknown planet after passage through a time warp, perhaps, in an unknown century. Especially when the spaceship's pilot dies, and his charts and tables are destroyed. Now survival was up to Max . . ." ; 5¾" - 6¾" Tall . Good. CLEAN TEXT AND EDGES BUT TONING. TIGHT SPINE, VERY LIGHT OUTER COVER WEAR. 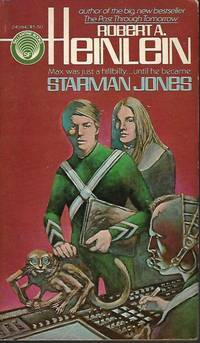 - First Ballantine MM Paperback Printing - 1975. Author: Robert A. Heinlein. 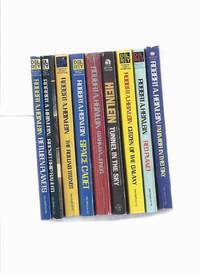 - We welcome and respond promptly to customer inquiries about the books we offer for sale. We grade conservatively, package securely and ship immediately. Excellent customer service. Satisfaction guaranteed. New York: Ballantine Books. Good with no dust jacket. 1976. Pocket pb. 0345243544 . Ballantine Del Rey. Used - Good. Good condition. US: Ballantine Del Rey. Mass Market Paperback. 0345243544 Very good few creases. books carefully packed and shipped promptly . Very Good. 1975. Ballantine. Very Good with no dust jacket. 1975. be. 0345243544 . Mass Market Paperback in good condition, squared, tightly bound with an unmarked text. There is a front cover spine hinge crease with some creasing on the spine. The previous owner's name Is written on the front free end paper. 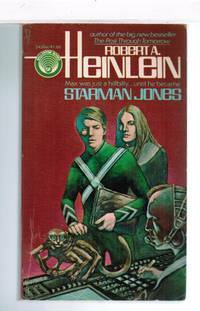 "This is one of Heinlein's most well-known juvenile science-fiction adventures. It charts the career of a runaway as he grows up, eventually commanding his very own spaceship. 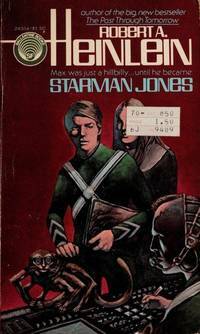 Max was just a hillbilly ...until he becomes Starman Jones." ; 0.7 x 6.7 x 4.1 Inches; 252 pages . New York: Ballantine, 1975. Softcover. Very Good. First thus. Very good in wrappers. Paperback book. Slightly rubbed. Pages browned. Please Note: This book has been transferred to Between the Covers from another database and might not be described to our usual standards. Please inquire for more detailed condition information. Edition: Later and/or First Printings. New York, NY: N.Y. / New York: ACE / Del Rey - Ballantine Books, 1955 (actually 1970 ), 1975, 1977, 1978, 1st and Later Printings, 1978. ----------9 volumes ( ONE SHIPPING PRICE ), paperbacks, all are Very Good or better copies, some light wear, a bit of age toning to paper, some very faint spine creases, TUNNEL is an ACE edition with a 1955 copyright date but is actually 1970, all others are Ballantine of Del Rey editions, some store stamps, some ink names, a nice groouping, CADET, CITIZEN, BETWEEN and GALILEO are Canadian imprints, any image directly beside this listing is the actual book and not a generic photo. Later and/or First Printings.. Soft Cover. Very Good (see description). Illus. by Darrell Sweet, Lee Rosenblatt, Steele Savage Cover Art.